Who Anglo-American airborne unit, the 1st Airborne Task Force, and amphibious elements and a fully mobilized unit of the Allied tanks, tank destroyers, and mechanized infantry of the U.S. Seventh Army, under the command of Lt. Gen. Alexander Patch (1889–1945), assisted a day later by a force made up primarily of the French First Army (at the time known as French Army B) commanded by Gen. Jean de Lattre de Tassigny (1889–1952). In addition the French Resistance of the FFI (French Forces of the Interior) played a major martial role. Allied strength numbered 175,000–200,000. Opposing the Allies was the understrength, thinly positioned, and poorly armed German Army Group G (Heeres­gruppe G) under Col. Gen. Johannes Blaskowitz, consisting of second- and third-grade divisions numbering 85,000–100,000 troops. Several units consisted of “volunteered” Soviet prisoners of war. The only potent unit inside Army Group G was the 11th Panzer Division, which performed outstanding maneuvers in delaying the Allied advance in southern France. Why After the successful execution of the Normandy landings (Operation Overlord) in June 1944, which freed vital amphibious assets, the Allies struggled to resupply their growing forces in France. The Germans had destroyed the harbor at Cher­bourg on the Cotentin Peninsula in Northwestern France, and a freak gale had damaged the Mulberry artificial harbor at Omaha Beach, one of two artificial harbors the Allies had planted off Normandy’s invasion beaches. This made seizure and control of the French Mediterranean ports at Marseille and the military harbor of Toulon increasingly attractive to the Allies. What Despite being a large and complex military operation with a well-executed amphi­bious and air­borne component, Operation Dragoon is not well known, being over­shadowed by the earlier and larger Operation Overlord. 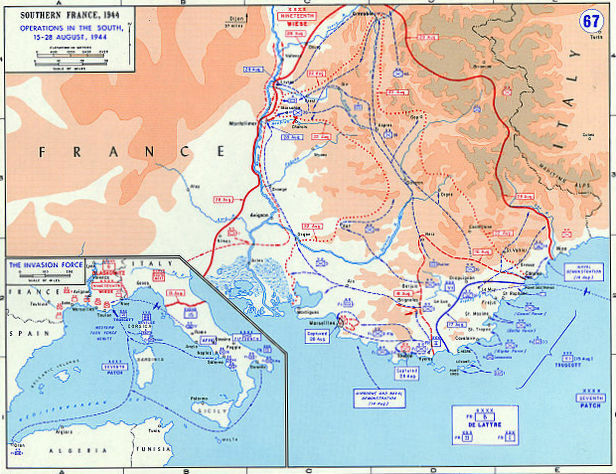 The invasion of Southern France began when Allied forces landed on the French Riviera between Toulon and Cannes, which lay east of Toulon near the Italian border. Blaskowitz, given the task of defending the south of France from an imminent Allied invasion, was badly outnumbered on the ground and in the air (200 aircraft to the Allies’ 2,000). He managed, however, to bring in German units, stabilize his front, and lead an orderly withdrawal to the north to avoid encirclement. U.S. Army units pursued Blaskowitz up to the Vosges Mountains, a range of low mountains in Eastern France bordering Germany, before pausing to regroup. Outcome Operation Dragoon was an outstanding success for the Allied forces. German resistance, with the exception of one assault beach, was low. The German defenders were initially confused because the French Resistance had cut off communication lines between their units. Nonetheless, by the night of August 16/17 Army Group G head­quarters realized that it could not push the Allies off their beachhead. Army Group G decided therefore to sacrifice Toulon (liberated on August 27 with a loss of 17,000 German POWs) and Marseille (mostly liberated by August 27 with a loss of 11,000 POWs) to buy time for a retreat through the Rhone Valley. However, in both harbors German engineers had succeeded in demolishing port facilities to deny their use to the Allies. The pursuit of the German units continued as one Rhone city after another fell (Lyon, Dijon), and in a timespan of 40 days most of France had been liberated. On September 10 Dragoon units were able to establish contact with units from Gen. George S. Patton’s U.S. Third Army, and the pursuit, now slowed almost to a crawl due to over­stretched supply lines from the south, ended later in the month when Army Group G reached the sanctuary of the Vosges Mountains, leaving over 130,000 troops trapped behind Allied lines. Eventually, the southern route opened by Operation Dragoon became a significant source of supplies for the Allied advance into Germany, providing roughly one-third of the total Allied requirement.